Lee Tinsley went into enough of a slump in late July 1995 to be benched. But, by September, he'd worked with Red Sox hitting coach Jim Rice and felt he might be back on track, The Hartford Courant wrote. Despite the benching, Tinsley was concluding his best season to date and, perhaps, the best season of his five-year major league career. Tinsley hit .285 for the Red Sox over 100 games played. Tinsley had that season with the Red Sox in his ninth season as a pro. His first season as a pro came in 1987, taken by the Athletics in the first round of the draft, out of Shelby County High School in Kentucky. Tinsley started with short-season Medford, hitting .174 in 45 games. He returned to the Northwest League in 1988, hitting .250 at Southern Oregon. That August, Tinsley picked up three hits in a game, including a home run, in a win. Tinsley moved to single-A Madison in 1989, staying there for 1990. He made AA Huntsville in 1991. He was also traded, to the Indians in July with another player for Brook Jacoby. He got his first look at AAA in 1992, at Colorado Springs, then he arrived in the Mariners system, taken off waivers. It was the Mariners who first brought Tinsley to the majors. Tinsley debuted with the Mariners in April 1993, getting into 11 games before spending the rest of the season at AAA Calgary. 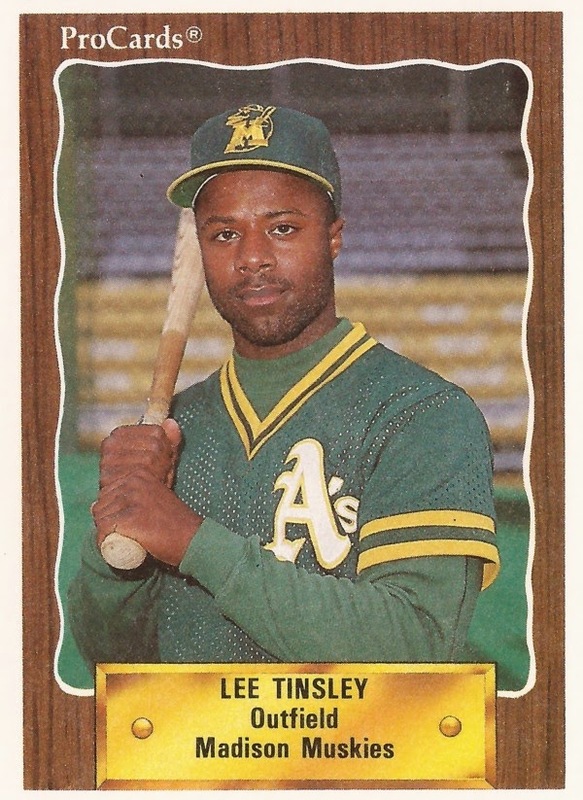 Traded to the Red Sox in March 1994, Tinsley got into 78 games that year, hitting .222. He then returned for those 100 games in 1995. In early July 1995, Tinsley failed to produce in crucial situations in the first three games of a series with the Tigers. In the finale, though, Tinsley hit the game-winner, a bases-loaded single. "It was very satisfying," Tinsley told The Associated Press afterward. "It lifted a lot of weight off my shoulders." Starting 1996, Tinsley was with the Phillies, sent there in a January trade. But his stay was brief, 31 games. He got just 7 hits in 51 at bats there, striking out 22 times. He was sent back to the Red Sox in June. On the year, Tinsley hit .221 in 123 games. He finished out his major league career in 1997, with 49 games back with the Mariners. Tinsley, though, continued playing in the minors through 2000, playing in Mexico his final season. Tinsley has since started a post-playing career as a coach. He served in 2001 as hitting coach for short-season Yakima. By 2006, he was first-base coach for the Diamondbacks. He moved to the same job with the Mariners in 2009, serving through 2010. In 2007, Tinsley was also the Diamondbacks' outfield coach, watching over the progress of young Chris Young. "He's getting that aura of when that ball’s hit out there," Tinsley told The Arizona Republic that year of Young, "they (hitters) kind of duck their head a little bit and say, 'Well, you know what, he's going to catch it.' "